On Tuesday, November 28th, twenty-one refugees gathered with a vague idea of how the upcoming day, full of activities, would be spent. In the same space assembled five facilitators, who were unsure of what the day’s research activities would reveal, and whether the participants would even be willing to discuss and share their experiences. After a preliminary round of tea, the day commenced. Koosh, in collaboration with Campfire Innovation, carried out the all-day research event to begin the much-needed process of vamping up the communications line between grassroots and refugees. The end goal of these surveys was to help grassroots organisations solve widespread and pressing needs of the community by receiving direct feedback from the refugees. Group discussions, consensus decision-making, roleplaying, questionnaires, and other research methods were employed to glean insights about the best practices for grassroots organisations, with an emphasis on the grassroots organisations’ approaches to receiving the feedback of the refugees they serve. Koosh is particularly well-suited to address the problem of refugees feeling left out of the decision-making process in grassroots because Koosh itself is a team of refugees and migrants, who aim to aid integration, communication, and social cohesion for the refugee and migrant community in Greece through innovative research and multimedia projects. As demonstrated by the day’s accomplishments, Koosh also endeavours to support cooperation and discussion between refugees and NGOs in order to identify and to address urgent needs of the community. The participants of this research venture were all refugees, who provided face-to-face responses about services made available to their community by grassroots to trained Koosh facilitators in Farsi and Dari. It is our goal that the conclusions drawn from the day’s research will help to renovate the way in which grassroots take into consideration feedback from the refugees themselves. During the event, the participants were divided into four groups. This exercise required participants, in their groups of five to six people, to map out which factors make up the best practices for grassroots organisations currently serving the refugee and migrant population. It quickly became apparent that the universal concern across all four groups was Communication with Communities, which refers to the ability of refugees to be significantly involved in the dialogue and decision-making for services available to them. Other concerns that closely followed were Respect and Support for Minors. While Respect was meant in a general sense, Support for Minors specified the deteriorating situation of minors – in particular, those who are unaccompanied and a relatively new occurrence. During this exercise, each team was given a scenario involving a specific challenge faced by grassroots organisations. 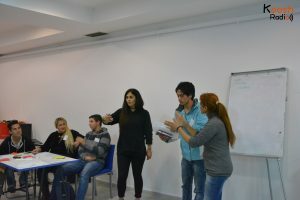 The scenarios were based on existing organisations and groups working with the refugee community in Greece, such as organisations providing information, distribution groups, volunteer groups, and community centres. After participants worked on a scenario for approximately ten minutes, a new challenge was presented to them. The teams then had to re-evaluate the situation and find practical solutions, with special attention paid to including best practices. One of the significant misunderstandings revealed was that the differentiation between large NGOs and smaller grassroots and civil society initiatives is not always clear. It is therefore imperative that teams communicate the limit of their resources as it makes it possible for refugee communities to understand shortcomings in services. "When it comes to asking for feedback, I just wish they would act on it, or at least come and tell us our feedback was some use. Because I can speak English I can give my ideas to some organisations, but what is the point if they don't do anything with my idea?" That being said, when an organisation is facing a challenge, the results of this exercise suggest that feedback lines between organisations and refugees could be improved. Organisations should make visible efforts to correct the problem, proactively rebuild trust through communication and discuss problems with their community members or residents. Integrating refugee feedback into the activities of an organizationThe third exercise.Participants were also asked whether there were any mechanisms currently in place for them to give feedback about grassroots organisations’ services. More than 60% of all participants suggested there were no methods they knew of to give their feedback to organisations; this is due perhaps to a lack of awareness or publicity of feedback mechanisms. Factors preventing refugees from giving feedback were generally two: loss of trust in organisations, or a hesitation arising from prior instances of being ignored or not seeing any results of their feedback; and fearing repercussions and negative consequences if the participant were to give critical feedback on services. Furthermore, respondents were asked which methods they preferred for giving their feedback on services provided by grassroots organisations. The most prominent response was the Face-to-Face method (30%). When questioned further on to whom they wished to give face-to-face feedback, the greatest amount of respondents (40%) said a Manager from the organisation. In addition, respondents were questioned on whether anything prevented them from giving feedback about grassroots services; just under 75% of them indicated that there was nothing preventing them from giving their feedback. These are important factors to take into account for organisations wanting to move from informal communication with refugees to clear processes that establish open communication, more engagement and joint action. Taking into consideration the findings of this exercise, it is recommended that each organisation arrange regular listening group sessions with various demographic groups (although it should be noted that an authoritative figure within the organisation, accompanied by a trustworthy interpreter, must facilitate these groups regularly). Alternatively, an independent organisation that is focused on obtaining feedback on services could carry out these listening groups, providing unbiased facilitators who can communicate in the beneficiaries’ mother tongue, and achieving credible and honest feedback. The research indicates how crucial it is for organisations to embrace methods for communicating with communities and to incorporate them in their daily proceedings; this is particularly necessary now, when the situation for refugees has transformed from an emergency situation to a post-emergency, rehabilitation, and integration situation. Refugees’ requests to be involved in decisions, services and dialogue concerning their community show a sense of empowerment that should be actively encouraged. Organisations need to create innovative methods for obtaining feedback, because being disregarded has made refugees lose trust and confidence in the value of sharing their perspectives. Furthermore, the existing feedback mechanisms must be advertised to as many people as possible, because many refugees have not been made aware of them. There is a general understanding that giving feedback will result in negative consequences – such as having privileges and services taken away – from the organisation. In order to prevent this from happening, feedback must be encouraged and proven to be influential in the organisation’s decision-making process. give an impactful voice to refugees and learn about their opinions/feedback? respond to proposals and feedback? involve refugees in decision-making inside the organisations? You can view the full research-report here and infographics here.